The Bangalore Political Action Committee (BPAC) inaugurated the second batch of its flagship program- B.CLIP (B.PAC Civic Leadership Incubator Program) amidst the presence of Bangalore’s citizens, intellectuals and political representatives. The inauguration of the second batch of B.CLIP solidifies B.PAC’s commitment in ensuring the creation of a talented and capable pool of leaders for the city. The B.PAC Civic Leadership Incubator Program (B.CLIP) is a 9-month Leadership Training Program that seeks to inspire, equip and mobilize aspiring citizens to engage in the political process leading up to the municipal corporation elections and help improve city governance. The program is a combination of both theoretical knowledge and practical on-field work under the guidance and mentorship of experts in the field of public policy and urban development. The participants of the first batch of B.CLIP are working on one of the four identified projects streams- waste management, water, sanitation and lake restoration, safety in the ward and revenue augmentation and expenditure management in BBMP in their respective wards. B.CLIP focusses on the core issues faced by every ward and the projects reflect these ideals. “B.CLIP started out as a mere idea about a year ago and we are proud to see the idea take shape in the form of committed and informed citizens working for a better Bangalore. We are proud to inaugurate Batch 2 and congratulate Batch 1 on successfully completing their classroom session”, said Kiran Mazumdar Shaw, President B.PAC. “The 50 ward level projects that the Batch 1 is working on will lead the way to true citizen engagement in civic and political issues to resolve complex problems “, she said. “Being a part of the first batch of B.CLIP has been an enriching experience. I have been taught important aspects of managing a city and I have been able to put that knowledge to great use for my on-field project”, says Madhuri, a participant of the first batch of B.CLIP. The second batch of B.CLIP is a composition of citizens from various walks of life determined to transform the face of urban politics. 102 applications were received for the second batch of B.CLIP out of which after a gruelling selection process, 60 candidates were selected. In a move to bring about adequate representation of women in politics, efforts were made to encourage more women to apply for the program. The second batch of B.CLIP has 13 women participants. The candidates are drawn from across party lines though the majority are not affiliated to any party. The motivation to go ahead with the second batch of B.CLIP has come from the response, encouragement and support given to the initial batch. “The cause of enabling the growth of able leaders for the city of Bangalore is an important one and B.PAC would like to train atleast a 1000 citizens in the next 5-7 years who care for the city and want to partcipate in its orderly transformation. The leaders that we create now will determine the quality of life, growth and sustenance of the city and its citizens in the coming years”, said Revathy Ashok, CEO of B.PAC. B.PAC is a non-partisan trust working towards ensuring a better quality of life to the citizens of Bangalore. B.PAC focuses on ensuring constructive dialogue between the political representatives of the city and the citizens. B.PAC works for building and sustaining a better Bangalore. The process of identifying candidates with passion for public service for Batch 3 has just begun. Applications are open for Batch 3 of B.CLIP and B.PAC urges passionate citizens to apply online by visiting http://www.bpac.in/bclip/, write to bclip@bpac.in, follow on https://www.facebook.com/BPACofficial or call +91-9886196640 for details. This pressnote was sent by Sharath Shroff of B.PAC, and has been published on Citizen Matters as part of its service ‘Message Forward,’ meant for nonprofits and individuals to spread publis service information. After his maiden election victory to the Andhra Pradesh state assembly, Dr.Jayaprakash Narayan, Lok Satta party’s founder, visited Bangalore recently to give the party’s local operations a push. 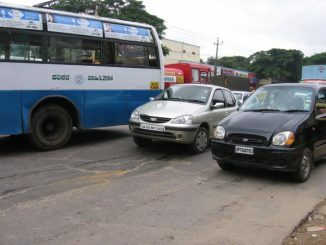 Until the other underpass is constructed the traffic will be slow moving near the Kadubeeshanahalli junction.